What to watch for in the NIT final four, which features Valparaiso against BYU and San Diego State against George Washington. While you’ve been watching the 68-team NCAA tournament winnow its way down to the Final Four, the NIT has been staging a little dance of its own. Among the final four teams—BYU, George Washington, San Diego State and Valparaiso—are three that were in the mix for the Big Dance right up to Selection Sunday, which should make for some compelling games at Madison Square Garden in New York City. The NIT semifinals are Tuesday, with the winners meeting in the championship game on Thursday. Here's everything you need to know to get caught up on that other tournament. Teams are presented in alphabetical order. The Cougars enjoyed a fine regular season, knocking off both Gonzaga and Saint Mary’s in the West Coast Conference, as well as Missouri Valley Conference champion Northern Iowa in non-league play, but they really weren’t anywhere near an at-large bid. That’s what happens when you lose games to Harvard, Long Beach State, Pacific, Pepperdine and Portland. Still, BYU earned a No. 2 seed in the NIT and made it to the Big Apple by going through No. 7 seed UAB, No. 3 Virginia Tech and No. 4 Creighton. They beat the Bluejays despite getting just 20 minutes and 10 points from star senior guard Kyle Collinsworth, who played with the flu. He’s expected to be 100% for their semifinal matchup with Valparaiso. The Colonials held onto their at-large hopes until a loss to St. Joseph’s in the quarterfinals of the Atlantic 10 tournament. George Washington, a No. 4 seed in its region, had arguably the toughest path to the NIT semifinals of any of the four teams, beating No. 5 Hofstra and No. 1 Monmouth on the road, and then taking down No. 2 Florida after the game had to be moved to GW's campus because of renovations being done at the O'Connell Center in Gainesville. The Pride were the co-champions of the CAA and the Hawks won the MAAC in the regular season while the Gators were right on the NCAA tournament bubble all year long. Junior forward Tyler Cavanaugh has averaged 21.7 points and 9.3 rebounds for GW in the tournament. The Aztecs dominated the Mountain West this season, going 16-2 to win the regular season race by three games before falling in the conference tournament final against Fresno State. That kept them out of the NCAAs for the first time since 2009, another season in which they advanced to the NIT final four. This year, San Diego State got a No. 2 seed in the NIT and beat No. 7 IPFW, No. 3 Washington and No. 4 Georgia Tech to get to MSG, winning their three games by a combined 55 points. There’s a reason why the Aztecs were one of the first teams on the Selection Committee’s cutting room floor. The Crusaders seemed to be ticketed for the NCAAs after going 16-2 in the Horizon League and notching non-conference wins over Oregon State and Iona. Instead, they lost in the conference tournament semifinals to Green Bay and were left on the outside of the field of 68. They got a No. 1 seed in their eight-team region from the NIT selection committee and beat No. 8 Texas Southern, No. 4 Florida State and No. 2 Saint Mary’s to become the lone top seed reach the final four. In fact, Bryce Drew’s bunch really hasn’t been challenged since losing that game to Green Bay, as Valpo has won its three NIT contests by a combined 41 points, including a 64-44 shellacking of the Gaels on March 22 to earn a trip to New York. 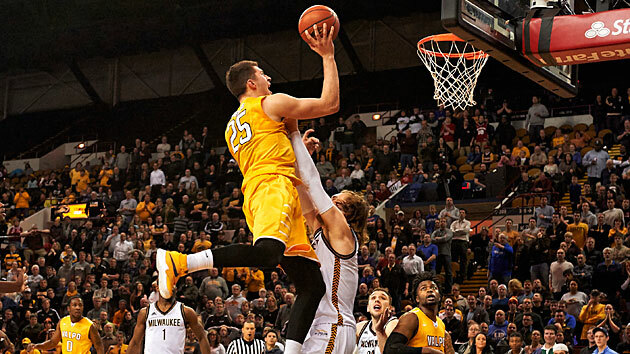 Crusaders forward Alec Peters might be the best player in the NIT. These two teams in the first semifinal could not be more different. The Crusaders play at a pace that ranks 263rd in tempo, according to kenpom.com. The Cougars, meanwhile, are No. 10. All that speed, however, does not make them careless with the ball. BYU is 32nd in the country in turnover rate, while Valparaiso is 222nd. Both teams feature one standout upper classmen. For Valpo, it’s junior forward Alec Peters, who shoots 55.5% from two-point range, 44.7% from behind the arc and 85.7% at the line. Peters is averaging 18.5 points and 8.4 rebounds per game and is the sort of player who can singlehandedly win his team a game. BYU’s Collinsworth, meanwhile, is Mr. Triple-Double, having racked up 12 in his four years in Provo, doubling the previous NCAA career record for career that had been held in part by Shaquille O’Neal. In 36 games this season, the 6'6" Collinsworth has averaged 15.2 points, 8.3 rebounds, 7.5 assists and 1.9 steals. The other side of the bracket pits George Washington against San Diego State. These teams are similar stylistically, with both playing at a slow pace. While the Colonials rely on their offense to win games, the Aztecs shine on the defensive end of the floor. They’re No. 2 in adjusted defensive efficiency on kenpom.com, and No. 1 in opponents’ effective field goal percentage. That could prove to be the difference in this game. San Diego State is, quite simply, a bad offensive team. All three of its leading scorers—Trey Kell, Jeremy Hemsley and Winston Shepard—shoot 43.5% or worse from the floor, which leads this team into some particularly ugly stretches of offense. On the other side, the Colonials’ leading scorers—Cavanaugh, Patricio Garino and Kevin Larsen—all shoot at least 50% from the field and 42.4% from behind the arc. They may not be comfortable playing at a quicker pace, but if GW is hitting its shots, San Diego State just won’t have the offense to keep up. All four of these teams are capable of cutting down the nets, but Valparaiso has been the best among the four from wire to wire this season. The Crusaders will claim the first NIT title in program history, beating George Washington in the championship game.